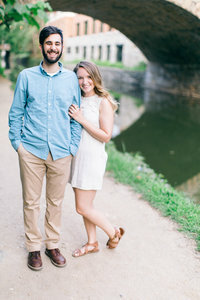 A couple of weeks ago, I got the incredible opportunity to meet John and Layla at Meridian Hill Park during the sunrise for their engagement session! We strolled through the gardens and beautiful architecture, all the while talking about their sweet wedding day to come. After working together for five years, John finally asked to take Layla to dinner “and to let him pay for it.” There had been a few other hangouts together, but John really needed to spell it out for Layla to get it. Their first date was dinner and a movie in Georgetown, and then following that, their second date was to see Florence and the Machine in concert – Layla’s favorite. It was by the end of that night, when they were singing and dancing with fellow strangers next to them, they knew they had something special. After returning home from a relaxing vacation in the Virgin Islands, they wanted to start getting back into her Saturday morning routine of going to the gym. John waited until Layla started her workout class before he ran home to setup a marriage proposal, and proceeded to return to the gym as if he never left. As they walked home through the first snow of the season, they talked about how it was time to take down their little Christmas tree. If our dream date took place in DC, we love to enjoy a nice dinner sitting outside and taking in the passerbys. Our favorite restaurant is Le Diplomate, which is right in our neighborhood. They can’t wait to see each other for the first time on their wedding day, the very first day of their marriage! They are so eager to celebrate with friends and family on a beautiful rooftop overlooking the famous sites of our hometown – Washington, D.C.